Popcorn Ceiling Removal Charlotte, NC and surrounding areas for unbeatable prices. Charlotte Drywall Repair is a fast and affordable solution for removing your ceiling texture in Charlotte, NC and surrounding areas. We specialize in the professional removal of acoustic popcorn ceilings! 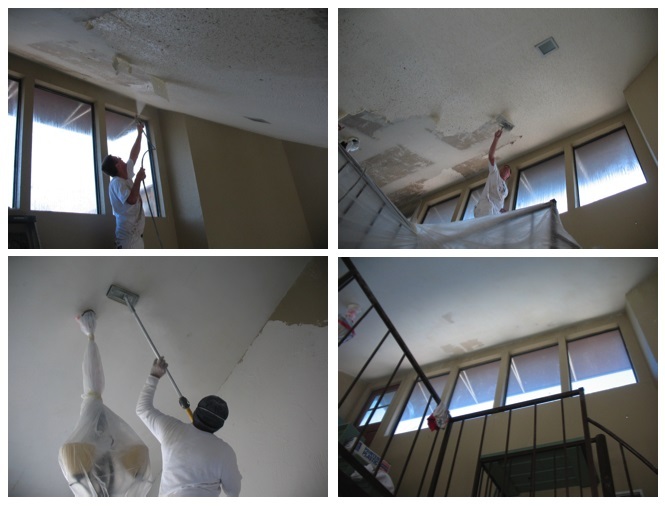 Our process is built to provide you with a clean and safe removal of your popcorn ceiling. 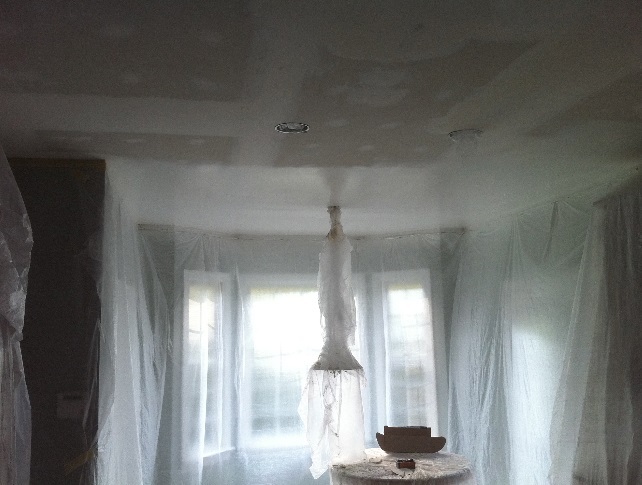 Popcorn ceiling removal is one of the must do items in any remodel or update project. Scraping off your popcorn ceilings provides a very visible, and therefore profitable upgrade to your home or flip project. The task of removing an acoustic ceiling is not complicated but it is very hard work and is best done by a qualified expert. We offer unbeatable pricing and fast service for your home. You can select to do as little as one room, or the entire home including closets. Call us at (704) 209-7015 for a free estimate. Remove furniture and items in the room. Seal off the entire room by hanging two millimeter plastic sheets from the crown molding all the way to the floor (Image 1). Put a window fan in the window for added ventilation. Add a drop cloth with a waterproof backing to the floor (Image 2). If the popcorn was added before 1979, get it tested for asbestos by either wetting down a small area with a sponge and scraping off a little to place in a small bag, or by having a professional come out and test it. Use a basic garden sprayer to wet down the ceiling. This will soften the ceiling texture and help to break down the adhesive bond making scraping easier. Work in an area about 5 feet square. It’s better to make several passes than allow the popcorn ceiling to absorb too much water which could damage the paper surface and the wallboards underneath. Wait 10-15 minutes for the water to soak in and then start scraping it off (Image 1) with a ceiling texture scraper (Image 2). Use a smaller putty knife to scrape the corners and the crown molding. When the acoustic is substantially removed you will begin to see the results and beauty of this process. But often the ceiling has been slightly damaged in the process. Repairing the Sheetrock, Recoating the Joints and Nails and smoothing out uneven areas is the final step in the removal process. See some of our work below. This is not an easy job and done without the proper equipment, ventilation and coverings it is extremely messy. Let the experts help you with your acoustic popcorn ceiling removal Charlotte, NC. Contact us with our contact us form on the left or give us a call for quicker service. Call (704) 209-7015 now to get a quality drywall repairman to your location. We provide professional drywall repair for your home or business. Call Now to get a free quote for your service! South Park, Belmont Drywall Contractor Remodeling & Renovations! 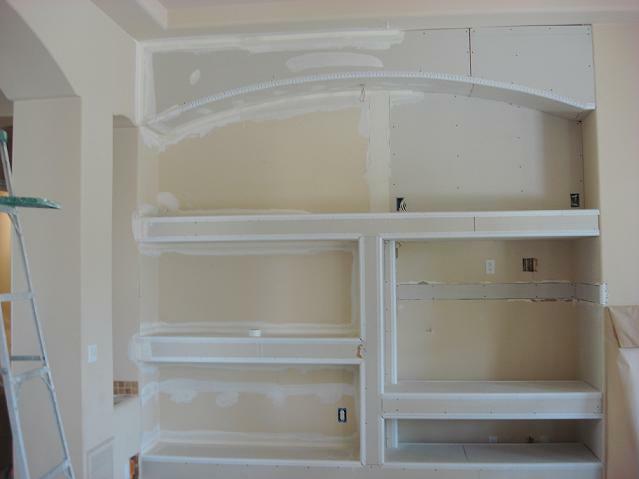 Contact Drywall Repair Charlotte NC, in Charlotte, NC for a experienced drywall contractor and work you can depend on. We offer outstanding remodeling, and renovations work, including home repairs. Drywall Repair Charlotte NC is here to help you decide which changes and upgrades are right for you. From remodeling and repairs of homes, Drywall Repair Charlotte NC can take care of it all. Contact us today at (704) 209-7015 with your building ideas or to discuss your drywall needs. With Charlotte Drywall Repair, you know you’re getting the best! No matter what you have in mind for remodeling, renovations, or home repairs, Drywall Repair Charlotte NC can handle it all. Contact us in Charlotte NC for all your construction needs. Drywall Repair Charlotte NC is locally owned and operated, we are licensed, bonded, and insured and has an excellent reputation and references to match in Charlotte and the surrounding areas.No job too small. Customer satisfaction is guaranteed with a professionally trained staff and top-quality workmanship. We offer estimates for you to review before making any construction or remodeling decisions. Don’t go with just anyone for residential or commercial construction needs because your house is perhaps the greatest and most important investment you’ll ever make. Choose the best when you need a drywall contractor–Drywall Repair Charlotte NC in Charlotte, NC is ready to serve you. 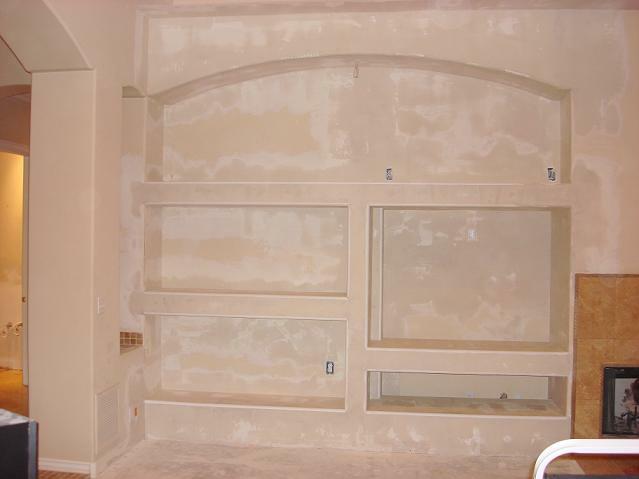 Looking for professional Drywall Contractors Charlotte NC? Drywall Contractors Charlotte NC is Charlotte’s leading source for drywall hanging (drywall installation), drywall taping, drywall patching, drywall finishing and drywall repair. Contact us and describe your drywall problems, we are available 7 days a week and ready to complete your job in the quickest time possible. Drywall Contractors Charlotte NC has been serving commercial and residential customers in Charlotte and suburbs for years and can quickly solve all sorts of drywall problems, wavy and uneven walls and ceilings, cracks, holes, nail pops, water damage, fire damage, insurance work, etc. New or old construction. Our guarantee is that all drywall repairs will blend in with no indication of a repair, custom textures will be matched as close as possible, work area will be masked and covered, walkways will be covered to keep floors clean, repair will be ready to paint (painting of repairs is available) repair will be warranted against defects for one year. 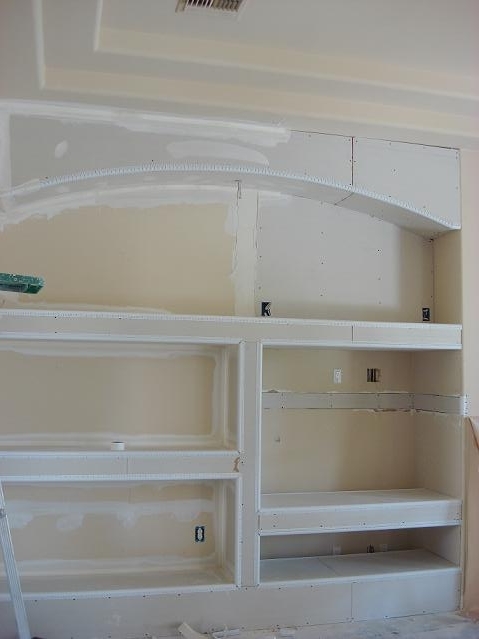 Charlotte Drywall Repair features fast, dependable, courteous service and estimates are free. Licensed and insured and all work is guaranteed.